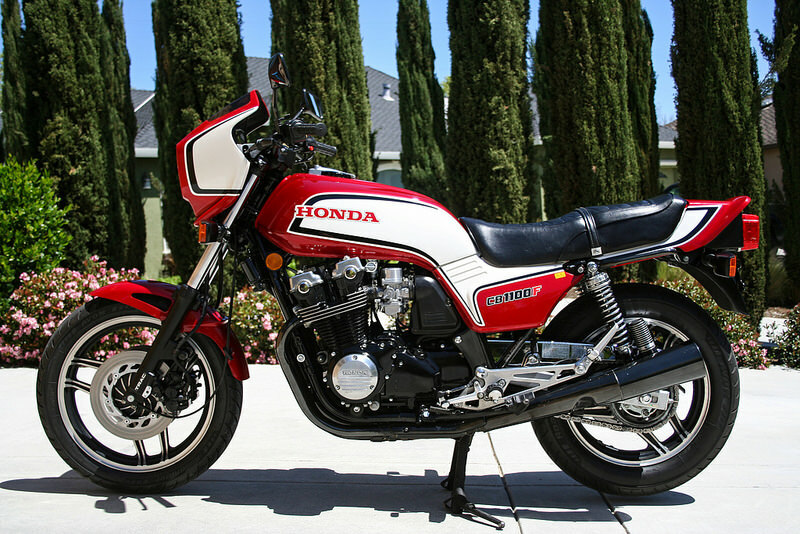 In 1979 Honda introduced a new type of motorcycle to the world, the CB750F SuperSport. This bike came with an impressive 748cc 4 cylinder engine , dual overhead cams with bucket and shims instead of rocker arms and four valves per cylinder making 72hp. This bike raised the bar with its superior engine performance and handling, making it stand above the rest in its class. Available to the rest of the world sooner, the CB900F SuperSport was introduced to North America in 1981. The CB900F had a slightly shorter wheelbase than the 750F, weighed 22.5 lbs more, but boasted a 902cc motor with 84hp. The 900F also came with a larger diameter fork, adjustable dampening shocks, stiffer frame, as well as larger valves and carburetors. The CB900F also served as the basis for Honda's Superbike racing efforts in the capable hands of Freddie Spencer and Mike Baldwin, lending further eyeball appeal and prestige. And perhaps best of all, the suggested retail price of the CB900F made it an irresistible bargain. In the last year run for the CBF series in North America, Honda brought the CB1100F SuperSport. The CB1100F was only available for one year in the United states, but was one incredible motorcycle. With its 1062cc engine, improved TRAC "anti-dive" forks, boxed swingarm, and 108hp, made this Honda's first 1100cc Superbike. Its arrival remains a benchmark for Honda in the evolution of the high-performance motorcycle. The CBF series of motorcycles will have for ever changed the way sportbikes were made. Welcome to the new and improving CB750/900/1100F SuperSport website. This site is a work in progress. Look through the forums, post a message or a picture of your bike, check out the pictures, most of all enjoy. If there is something you would like to see send me a note, and I'll see what I can do. If for some reason you can't get registered or login correctly or have been banned email me at cb1100f@cb1100f.net and make sure to put "login problem" in the subject line. New members please make sure to read the SuperSport FAQS these contain answers to many common questions. HELP KEEP OUR SERVER ONLINE!